Add on 2 classics. Thanks doc! I'll take an extra classic as well please! Last edited by Rodebaugh on Fri Nov 30, 2018, edited 1 time in total. Review for completeness. Mass PM Invoice goes out Sunday. Last edited by Rodebaugh on Fri Dec 21, 2018, edited 38 times in total. Payments will likely start coming in today and tomorrow. Mailing will begin tomorrow. 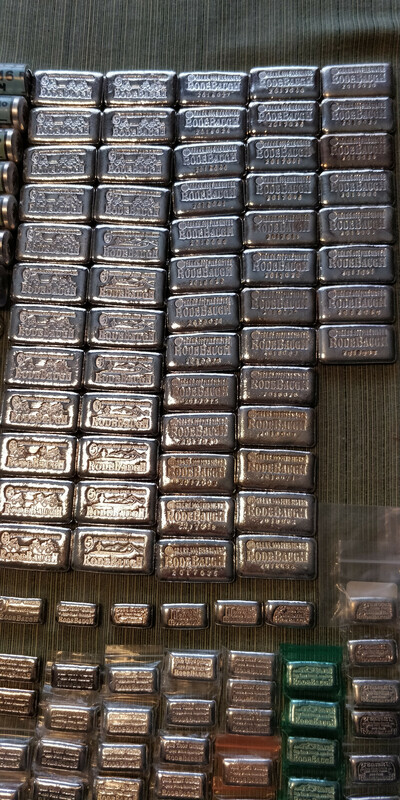 Here is a fun picture of the 100g ingots. The bars on the left are finished while the bars on the right are waiting for their final polish after heat annealing. It is a huge contrast. This is the 2018 100g Family Photo. 79 was the final mintage. 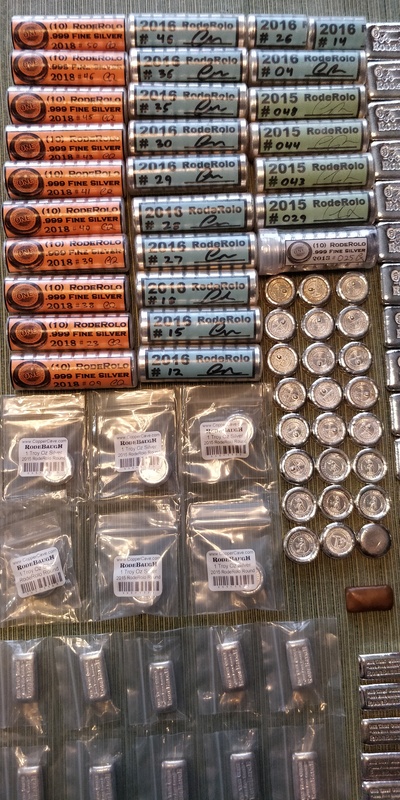 Rodebaugh wrote: Here is a fun picture of the 100g ingots. The bars on the left are finished while the bars on the right are waiting for their final polish after heat annealing. It is a huge contrast. This is the 2018 100g Family Photo. 79 was the final mintage. Interesting. Annealing is done to relieve stress in metals after it's been worked. Would that work hardening come from the stamping in the case of poured silver? If so, do you anneal before polishing or vice versa. Does it matter which? Come to think of it, why anneal at all since all silver ingots do is sit around and be all shiny and valuable? I'm using Viagra as a fluxing agent. I knew there was a secret sauce. I can see why Randy calls these "fondlers". Great little bars Doc. Thanks! Good luck with the hunt. snappy wrote: I can see why Randy calls these "fondlers". My thoughts exactly! A beautiful and fun little 100g bar! Stop by and say hi next time you're in the area. Thanks Doc! When's the next in the LBS series gonna come out? I 'spose you will need some R&R after this event, some well deserved R&R. Got my fondlers the other day and the fondling began. Wife got jealous and joined in, we'll stop there. Great stuff, Doc, please keep 'em coming. Looking forward to more Rodies, always. 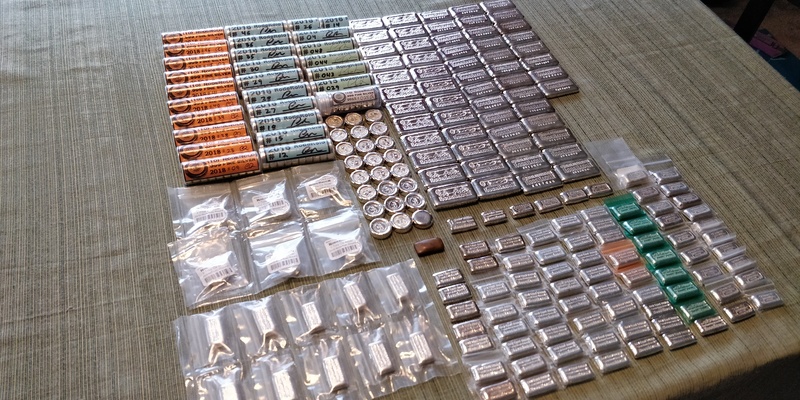 Finally found some free time to organize my Pumpkin Patch Silver. Should be a bit north of 600oz of fine WV ingots.